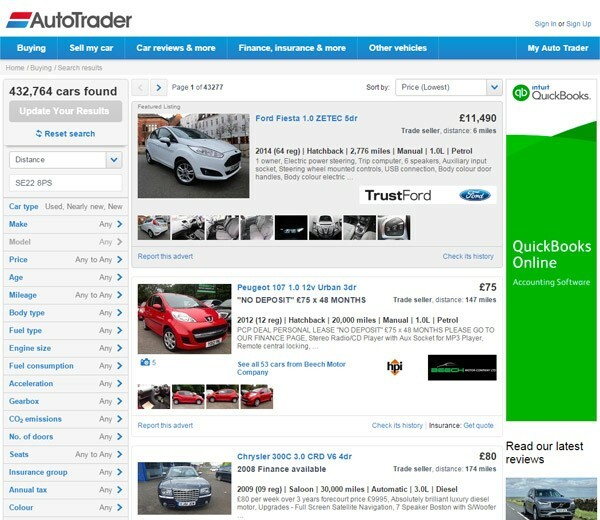 This was a role working on Interface Development for Trader Media’s online marketplace with over 1 billion page impressions per month. 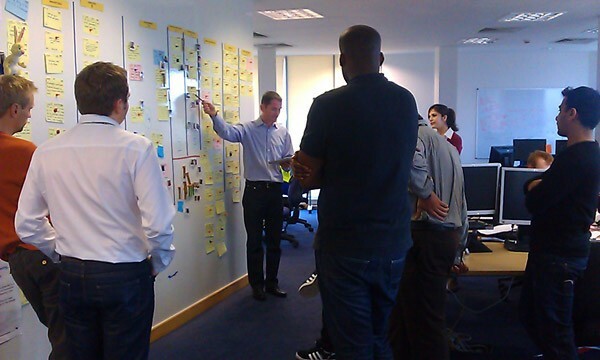 Our team used Agile development approach with Continuous Integration (CI), pair-programming and short development cycles based on Thoughtworks Extreme Programming (XP) model for Java/JUnit TDD projects. A 6 month cross-platform (iOS and Android) mobile app project for Masabi, a specialist mTicketing company based near London Bridge. 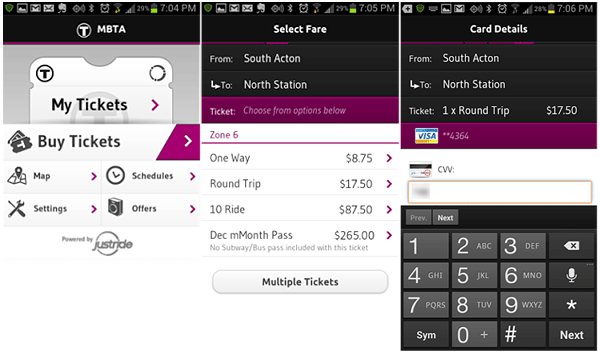 The MBTA mTicket application was launched in the Android and iPhone app markets in November 2012, and was a complete success grossing $1 million of sold tickets in the Boston Rail network for the first ten weeks of operation. 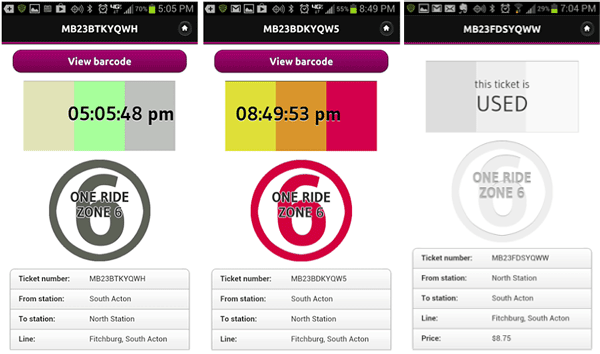 MBTA mTicket in the Google Play store. The process for purchasing tickets is straight forward, no complicated steps or black magic. 2) Choose a ‘From’ and ‘To’ Station from the list. 4) Choose an existing card (the app stores a payment key after the first time). 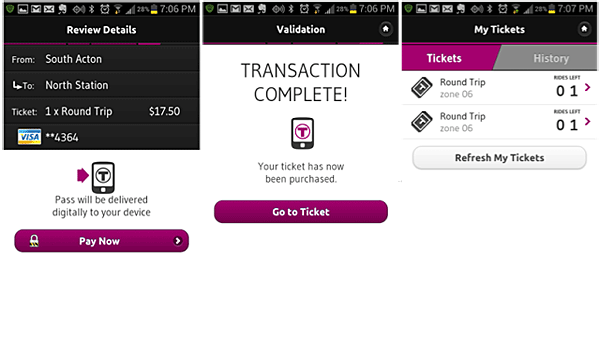 Once the transaction goes through, the ticket is loaded into the My Tickets section. You now have two round trips to Boston waiting for you. These last few panels are a shot of your ticket. The rectangle at the top shows the current time, the time block moves back and forth, and the three blocks are multi-colored. The color scheme changes on a daily basis according to a scheme that the conductor knows. Once the ticket is used it changes into a grey scheme. The conductor when he approaches will generally glance at the screen, nod with a “thanks” and put a paper slip in the holder above your head. Done. The MBTA mTicketing app went on to become a huge success shortly after launch. 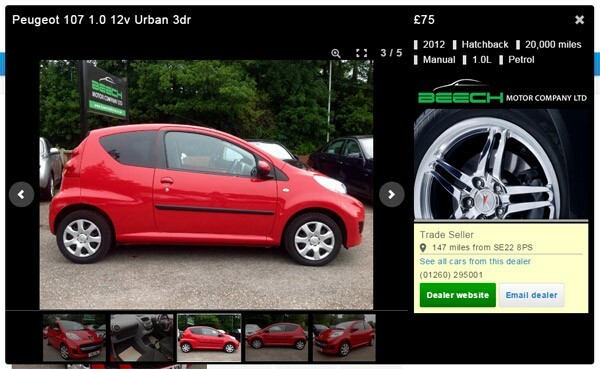 Customers reported a ‘seamless experience’ with ‘great usability’, ‘very convenient’, ‘neat & efficient’ etc. @mbtagm downloaded the #MBTA mTicket App today. real cutting edge! @mbtanow Love the new MBTA Ticketing App! Steven is a web application developer based in Melbourne, Australia. Steven specialises in creating rich interfaces and low-latency backend storage / data feeds for web, mobile and hardware platforms. He recently finished developing the MBTA mTicketing HTML5 mobile app which grossed $1,000,000 in the first ten weeks of operation. While each project has a different technology stack, these are some of the languages and applications that Steven uses more regularly.